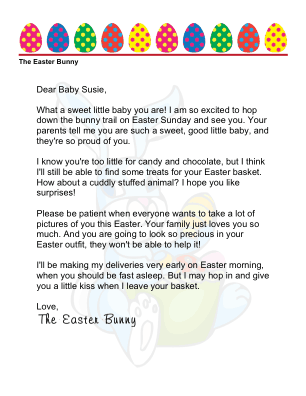 This letter from the Easter Bunny to a new baby makes a wonderful keepsake, as it asks for patience as the cute child has lots of pictures taken in his or her Easter best. What a sweet little baby you are! 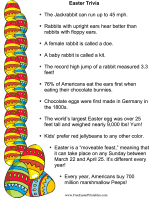 I am so excited to hop down the bunny trail on Easter Sunday and see you. Your parents tell me you are such a sweet, good little baby, and they're so proud of you. 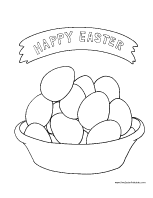 I know you're too little for candy and chocolate, but I think I'll still be able to find some treats for your Easter basket. How about a cuddly stuffed animal? I hope you like surprises! Please be patient when everyone wants to take a lot of pictures of you this Easter. Your family just loves you so much. And you are going to look so precious in your Easter outfit, they won't be able to help it! I'll be making my deliveries very early on Easter morning, when you should be fast asleep. But I may hop in and give you a little kiss when I leave your basket.